Over the past few months, Elsevier’s Journal Marketing Communications team has been busy behind the scenes, cooking up a range of projects to increase the information we provide to journal authors. Two of these projects have now reached fruition and were recently launched as pilots. Read on to discover more about Journal Insights and the Article Usage Report and what they might mean for your journal. With so much competition for good papers, ensuring your journal is on the receiving end of premium submissions can be a challenge. Equally, authors can struggle to find the best home for their research and we know that a desire for more clarity around journal performance is high on their wish lists. A new pilot has been developed to help alleviate these problems. 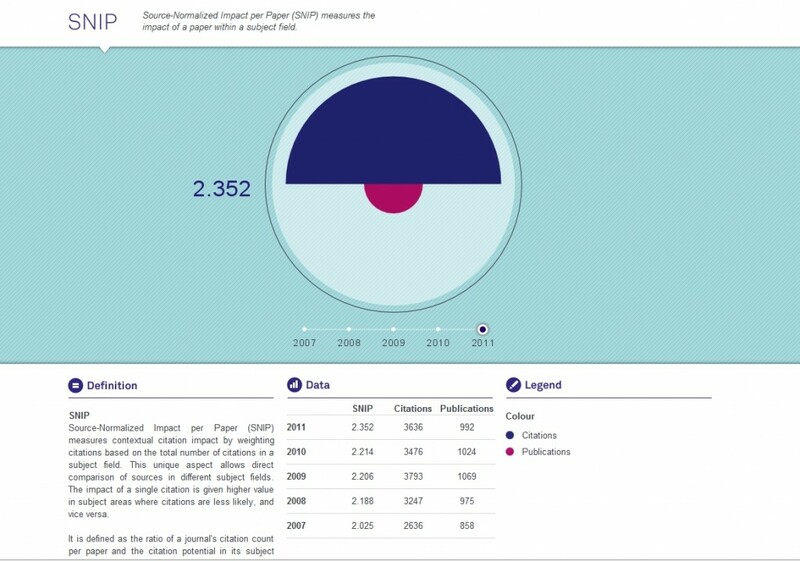 Launched in December 2012, the Journal Insights project aims to highlight your journal’s performance while providing the transparency authors seek. Six Elsevier titles are already taking part with plans underway to increase that number over the coming months. The journal homepage of each participating journal contains a new section, ‘Journal Insights’. Authors clicking on this link arrive at a landing page where they can select data visualizations of three key groups of metrics, developed to aid their decision making. Authors can choose between graphs displaying the Impact Factor, five-year Impact Factor, Article Influence and Eigenfactor, SNIP and SJR. Each graphic is accompanied by a definition of the metric and relevant supporting data. 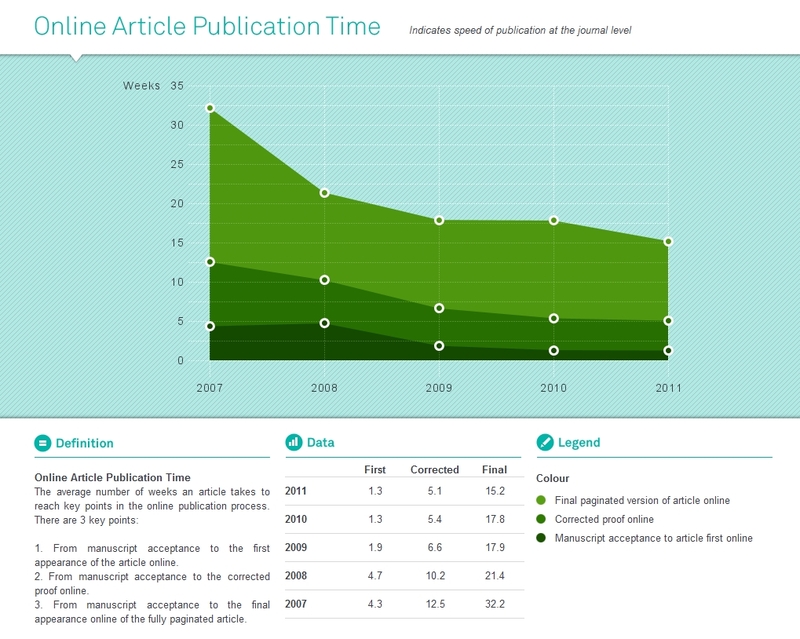 Authors can discover the average review speed for the journal over a five-year period. They can also choose to view the online article publication time (also known as production speed), which covers three key steps. These are: from manuscript acceptance to the first appearance of the article online; from manuscript acceptance to the corrected proof online; and from manuscript acceptance to the final appearance online of the fully paginated article. 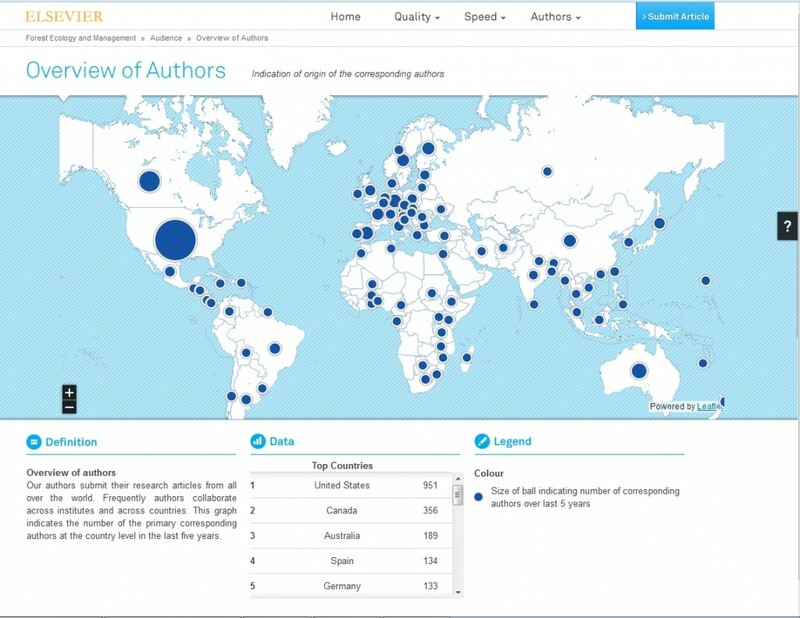 A detailed world map allows viewers to swiftly identify the geographical distribution of (corresponding) authors who have published in the journal within the past five years. 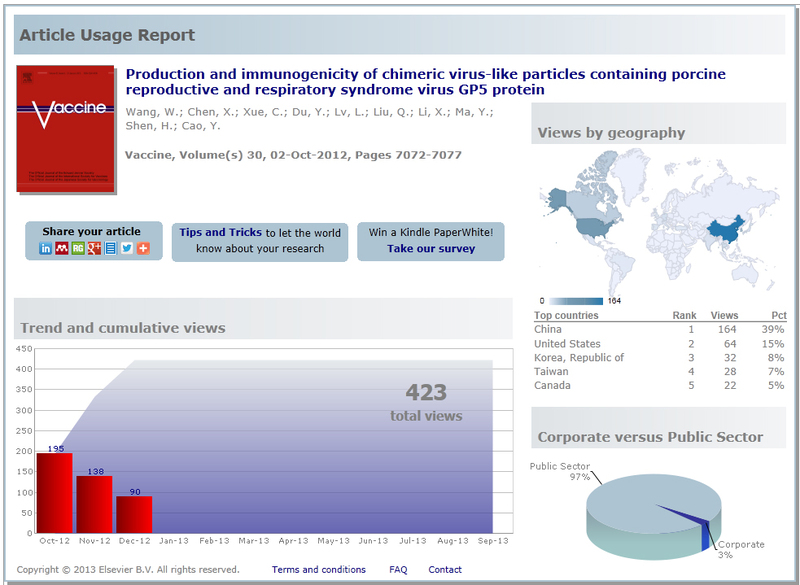 Data sources for the visualizations include ThomsonReuters (ISI), Scopus, EES and a number of internal Elsevier systems. Hans Zijlstra, Marketing Project Manager, is leading the Elsevier team behind the project. He explained: “About a year ago, we got together to think about how we could help our authors make a more balanced selection of journals for their papers. Our aim was to provide them with more insight. The team looked at a number of options for presenting the three groups of metrics but decided that a clean and simple graphical presentation would provide the strongest impact. An added bonus is that the visualizations have been built using mobile device-friendly software. However, as the technology has been developed with both PC and mobile use in mind, it works most effectively in IE9 browsers and above, as well as Firefox or Chrome. If you are using an older version of Internet Explorer, you may not be able to view the full interactive functionality. The next step will be to gather feedback from the editors and authors involved in the pilot to further improve the visualizations. Hans and his colleagues are already busy exploring the potential of additional developments to enrich the data sets and visualizations. If the pilot proves successful and the project is expanded, it will be on an opt-in basis. The team has the relevant data available for around 1,500 journals and your Publisher and Marketing Manager will be able to recommend whether the Journal Insights pod should be added to your journal homepage. Your Publisher can also pick and choose which metrics are shown and a variety of combinations are possible. If you have any thoughts on the project you would like to share you can contact Hans ath.zijlstra@elsevier.com, or simply post your comments below. Another pilot underway to support authors was also launched in late 2012. The new, complimentary Article Usage Report allows corresponding authors to assess the immediate impact of their published article. This complements our existing CiteAlert service, which comes into effect once an author’s article has been cited. How does the Article Usage Report work? 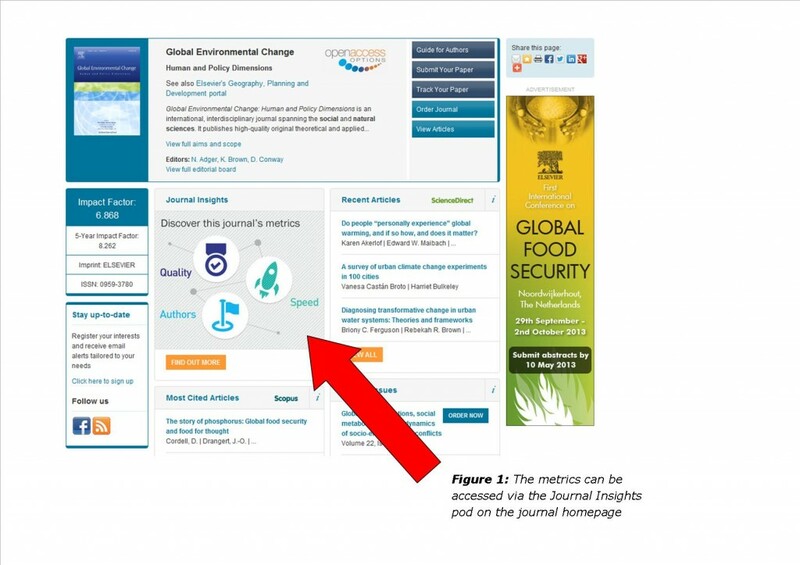 By the end of January 2013, corresponding authors from 50 selected journal titles had received an email containing a link to their personalized dashboard on ScienceDirect’s usage system. There they are able to view how often their articles have been accessed and by which countries. They can also find tools to promote the use of their paper via social media channels. The pilot aims to deliver insights into technical performance of the usage system and collect author feedback on usability and purpose. We aim to roll the pilot out on a journal by journal basis, beginning this summer. If you are keen to see your journal become one of the early adopters of the Article Usage Report, please contact your Publisher. Hans works in the STM Marketing Projects department in Amsterdam. He is responsible for projects focusing on journal and article metrics with the aim of improving our service to authors. He joined Elsevier in 1996 and held various marketing positions before leaving to take on roles in mail order, telecom, finance and sailing. He returned to Elsevier in 2008. Annette is the newly-appointed Director of Publishing Projects in the Publishing Services department based in Amsterdam. In her previous role as a Project Manager for Marketing Communications, she was responsible for piloting the Article Usage Reports with authors of 50 STM journals. Annette has been involved in various Elsevier programs across Operations and Publishing divisions since 2010. She has a Master’s degree in Geology and an MBA from Henley College of Management. This looks good. I have one query: can you explain why the impact factor and the associated metrics in its group are described as measures of 'quality'? I assumed from all the literature that they are measures of impact and influence, not quality. Perhaps you need to change the title of the metric group to 'Influence' or 'Impact'? Dear Dr Driver, while developing the Journal Metrics visualizations we recognized that metrics should be grouped. Quality metrics came up as a 'natural name', recognized by many people familiar with mainly the Impact Factor. I appreciate your suggestion to rename it to something like Impact or Influence. As we have only been rolling out the full system relatively recently we will not directly change the name but will certainly consider it for a new release. Thanks again for your interest. Hans Zijlstra, Project Manager Journal Metrics visualization project.